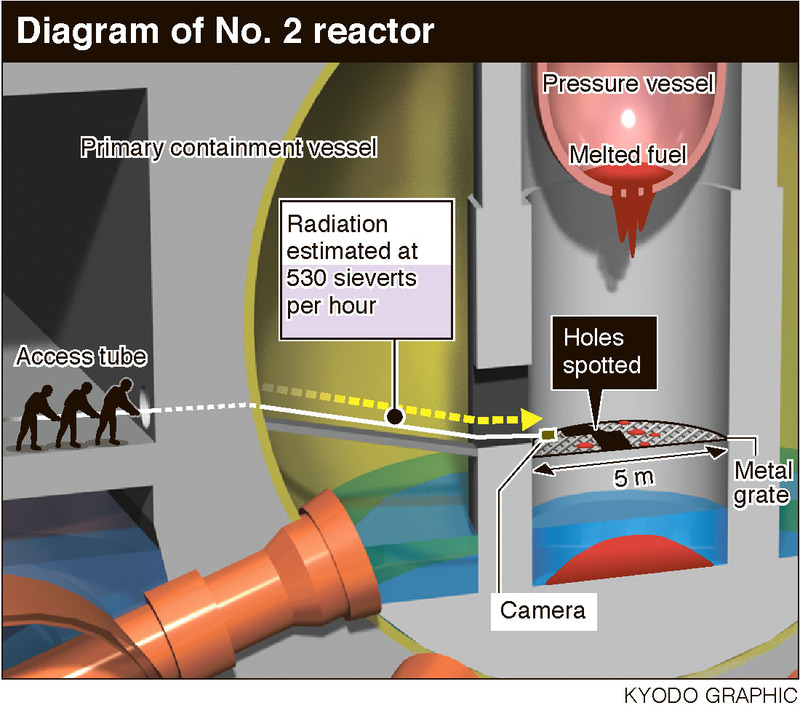 Tepco also announced that, based on its analysis of images taken by a remote-controlled camera, that there is a 2-meter hole in the metal grating under the pressure vessel in the reactor’s primary containment vessel. It also thinks part of the grating is warped. The hole could have been caused when the fuel escaped the pressure vessel after the mega-quake and massive tsunami triggered a station blackout that crippled the plant’s ability to cool the reactors. The searing radiation level, described by some experts as “unimaginable,” far exceeds the previous high of 73 sieverts per hour at the reactor. Tepco said it calculated the figure by analyzing the electronic noise in the camera images caused by the radiation. This estimation method has a margin of error of plus or minus 30 percent, it said. According to Tepco, readings of surface radiation on parts used inside a normally operating pressure vessel can reach several thousands sieverts per hour. The discovery spells difficulty of removing the fuel debris to decommission at the plant. 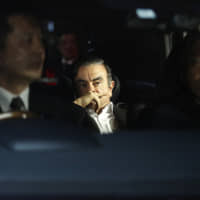 The government and Tepco hope to locate the fuel and start removing it in 2021. In the coming weeks, the utility plans to deploy a remote-controlled robot to check conditions inside the containment vessel, but the utility is likely to have to change its plan. For one thing, it will have to reconsider the route the robot takes into the interior because of the hole in the grating. Also, given the extraordinary level of radiation, the robot would only be able to operate for less than two hours before it is destroyed. That is because it is designed to withstand exposure of up to 1,000 sieverts. Based on the calculation of 73 sieverts per hour, the robot could run for more than 10 hours, but 530 sieverts per hour means it would be rendered inoperable in less than two hours. 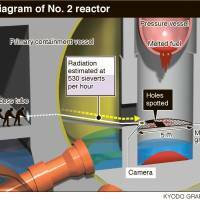 Tepco has been probing reactor 2’s containment vessel since last week. On Monday, it found a black mass deposited on the grating directly under the pressure vessel. The images, captured using a camera attached to a telescopic arm the same day, showed part of the grating was missing. Further analysis found the 2-meter hole in an area beyond the missing section on the structure. If the deposits are confirmed to be melted fuel, it would be the first time the utility has found any of it at the three reactors that suffered core meltdowns. The world’s worst nuclear disaster since Chernobyl in 1986 triggered core meltdowns in reactors 1 through 3. Portions of the core in each reactor are believed to have melted through their pressure vessels and pooled at the bottom of their containment vessels. The actual condition of the melted fuel remains unknown because the radiation is too high to check it. Meanwhile, a nuclear research organization unveiled on Friday a robot that will be tasked with surveying reactor 1 at the complex. Tepco plans to send the robot into reactor 1 in March, while its survey plan for reactor 2 remains unclear because of the high radiation levels. The stick-like robot is 70 cm long and equipped with a camera, according to the International Research Institute for Nuclear Decommissioning. 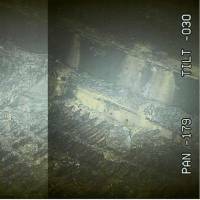 During a robotic survey in April 2015, the operator found no major obstacles in the path planned in reactor 1 but found water accumulating in the basement. 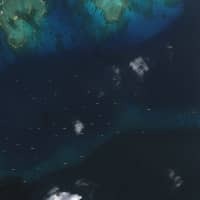 In the upcoming survey, it hopes to examine the water by deploying a camera and a radiation sensor. 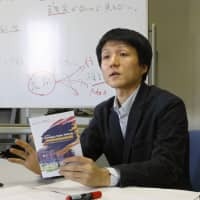 “Confirming the conditions inside the reactor is a first step toward decommissioning,” Minister of Economy, Trade and Industry Hiroshige Seko said in a news conference Friday. 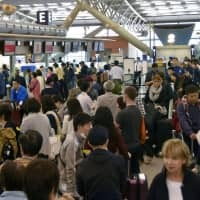 “While difficult tasks and unexpected matters may arise, we will mobilize all of Japan’s technological capabilities to steadily implement decommissioning work and rebuild Fukushima,” he added.